Излезе новият брой на списание "Текстил и облекло" - брой 5 за 2018 г.
Запознайте се с 4 брой, 2018г. на списание "Текстил и облекло"
Ключови думи: Болградска гимназия, модерно европейско училище, училищна печатница, Българско възраждане. 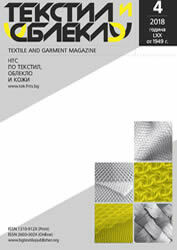 Резюме: For several protective textiles, the resistance against penetration is very important property and is kept high enough by using combinations of up to 20 layers of different fabrics. For many applications which are used in the protection area, aramid woven structures are normally used. Due to the fact, that many layers are required, it is assumed, that the using of multilayer woven structures could improve the stab resistance, but reducing the total weight of the assembly.